Following President Recep Tayyip Erdoğan's announcement to hold early presidential and parliamentary elections on June 24, Good Party (IYI Party) Chairman Meral Akşener announced Tuesday that she will run in the presidential elections and the party will be on the ballot amid discussions. Akşener posted a tweet on her official account, saying that she will run with 100,000 signatures backing her candidacy. A candidate for presidential elections should either be nominated by political party groups in the parliament – meaning at least 20 deputies – from political parties that obtained at least 5 percent of the vote in the last parliamentary elections or 100,000 voters, according to Article 101 of the Constitution. Speaking at the IYI Party's Istanbul provincial headquarters earlier in the day, Akşener stated that the party will run in the elections amid an ongoing dispute whether the party is eligible to be placed on the ballot. The electoral law states that in order to run in the parliamentary elections, a party is required to hold its first congress at least six months ahead of the elections and needs to have established provincial branches in at least half of the country's 81 provinces, or have a group in Parliament. "We have completed our first ordinary congress on Dec. 10. Our 68 provincial and related district branches have been established accordingly. If you count from that date, the IYI Party is ready to participate the elections as of June 10. I urge everyone to watch their step on this issue. 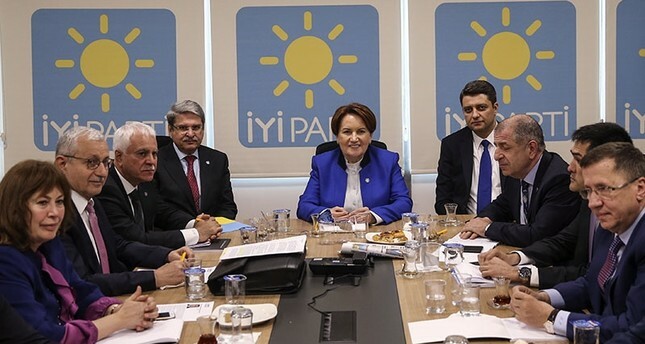 IYI Party is the most ready party to participate in the elections," Akşener said. IYI Party Deputy Chairman Müsavat Dervişoğlu said the election schedule for the party started on Dec. 10, not on April 1. "Based on the date Dec. 10, 2017, we have the right to participate in any election to be held after June 12. So we are not worried," he said. However, there are conflicting views both within the IYI Party and other parties regarding the eligibility date. Previously on Tuesday, after Nationalist Movement Party (MHP) Chairman Devlet Bahçeli's call to hold the early elections on Aug. 26, IYI Party General Secretary, Party Spokesperson and Izmir deputy Aytun Çıray stated that the party had held its first congress by Dec. 28, 2017, and is eligible for every election after June 28. Moreover, the IYI Party chairmanship council said Tuesday that the party is eligible to run in every election after June 22. Özgür Özel, deputy group chairman of the Republican People's Party (CHP) said Tuesday that the IYI Party was not included in the Higher Election Board's (YSK) January-list of "parties that can participate in elections," and would not be able to participate if there is a snap election on Aug. 26, as suggested earlier by Bahçeli. "The Political Parties Law says that a party must have an organizational presence in at least 41 provinces in order to be elected. Then you would have to organize a grand congress and at least six months should pass from the grand congress. IYI Party will complete six months on Sep. 1. If the elections take place on Aug. 26, IYI Party cannot run for the elections," he said. However, IYI Party Vice Chairman İsmail Koncuk said that the Party would be able to run in the elections in any case. "The YSK made decisions on the Central Party and Emine Ülker Tarhan's Anatolian Party before the 2011 general elections. They completed their organizational work and joined the general elections. But despite everything, if the YSK says İYİ party cannot participate, we have plans B and C like we had a plan A," he said. The IYI Party, which mostly consists of former MHP dissidents, was founded in October 2017. Akşener was a prominent figure among MHP dissidents who heavily criticized the policies of the MHP's chairman of 20 years, Bahçeli, after the general elections on June 7 and Nov. 1, 2015. The intra-party debate ended when the dissidents were dismissed from the party after a heated process ended in courts. It has not participated in any elections so far, and its performance in the upcoming elections is highly speculated. Besides gathering signatures or party approval, presidential candidates should be 40 or older, university graduates and meet the other criteria to be elected as deputies, which are: holding Turkish citizenship, not being banned from public service, not holding any government or judiciary positions, not doing jail time totaling one year or more excluding involuntary, not being convicted of dishonorable offenses, of smuggling, of conspiracy in official bidding or purchasing, of offenses related to the disclosure of state secrets, of involvement in acts of terrorism or incitement, or encouragement of such activities.